Yamaha took the wraps off the 2018 Star Venture and introduced the concept of a “transcontinental tourer” capable of running with any bagger on the market. Cue up the Beach Boys on the state-of-the-art “infotainment” system and let the Good Vibrations of the big air-cooled twin eat up the miles. Wait a minute, air-cooled V-twin? The power plant is just one of the dichotomies that work together in the new Yamaha’s favor. 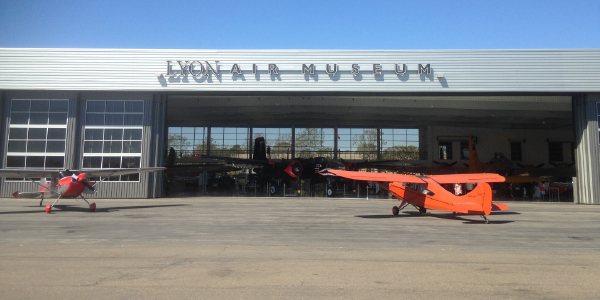 Yamaha’s media event was hosted at the Lyon Air Museum . The 1,854cc (113-cubic-inch) air-cooled V-twin gets fuel injection and dual plug heads, but looks and sounds the part. The 126 ft.lbs. of torque at 2,500 rpm is said to be best in class. 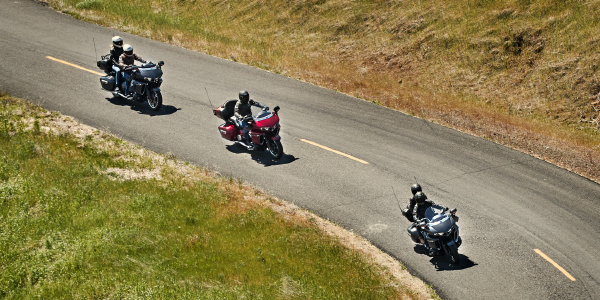 Merging the old school air-cooled twin with the new forward-reverse Sure Park parking assist system and traction control gives riders the best of both worlds. “It is a modern interpretation of classic elements and feeling wrapped in a timeless design,” Brooks claims. Speaking of wrapping, thousand of hours of wind tunnel testing created the cockpit that Yamaha says “cocoons” rider and passenger, and the electronically adjustable windscreen offers more than 3.5 inches of vertical positioning. External visors at the middle of the fairing can be adjusted to direct air toward or away from riders depending on conditions. And ducted vents inside the lower fairing can be opened or closed to further customize airflow for changing conditions. Further enhancing the level of comfort are adjustable rider backrest, heated grips as well as rider/passenger seats and backrests, a fully featured infotainment system and more. “The infotainment system is mounted high in the cockpit for maximum visibility,” notes Brooks. A 7-inch full-color LCD screen displays an array of information. Controlled via touchscreen, handlebar controls or voice commands via accessory headset and mic, the infotainment package gives the rider access to vehicle control and data, a range of audio sources and wireless Bluetooth communications options. The locking fairing storage includes a USB charging and interface port. By integrating vehicle systems into the infotainment console, running data such as trip computer functions and tire pressure can be easily confirmed on-screen. 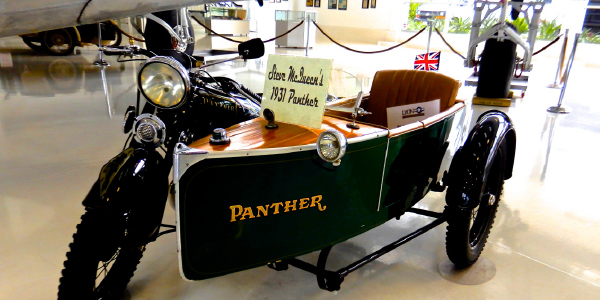 Above: Steve McQueen’s 1937 Panther was displayed among the motorcycles and aircraft at the Lyon Air Museum. The rider can crank Good Vibrations through paired high-performance speakers. The Star Venture audio package features AM/FM radio and can also play pre-recorded music or stream Pandora from a smartphone via the onboard USB, AUX stereo or Bluetooth wireless connection options. A range of infotainment upgrades are available with the Star Venture Transcontinental Option Package, including GPS navigation with points-of-interest and route logging to help simplify the planning, a CB radio, SiriusXM and SiriusXM Travel Link for music, weather and traffic information. Yamaha’s exclusive Dual Zone audio control allows rider and passenger to select different audio channels and hold private phones calls with an accessory headset and mic. Along with the infotainment upgrades, the package includes supplemental LED fog lamps, an additional pair of storage compartments for the passenger and an alarmed security system. 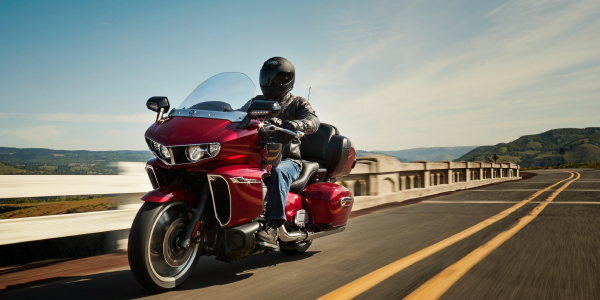 The bikes will be available in Granite Gray and Raspberry Metallic beginning in August at an MSRP of $24,999 for base models, and $26,999 for the Transcontinental Option Package. While the media was treated to a sneak peek at an air museum featuring the original transcontinental luxury tourers, the motorcycle riding public was treated to the unveiling at this year’s Americade Rally in Lake George, New York. The positive reception by both groups would seem to be music to Yamaha dealers’ ears. Good Vibrations indeed!